I am really amazed with this man. 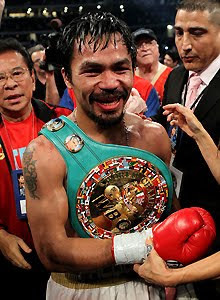 I was filled with excitement and thrill while watching his fight with Antonio Margarito. Pacquiao is really full of energy and power. You can see it on how he smashed Margarito's face. I just hate that person on his background (on his left side). Hahaha!! !